This month, buildOn is continuing to celebrate female leaders from across the United States who invested in our women’s empowerment initiatives this International Women’s Day. One of these leaders, Ginny Carroll, has committed her career to empowering women at home and abroad. She is the founder of the Circle of Sisterhood Foundation, a nonprofit organization that leverages the collective influence of sorority women to support organizations removing barriers to education for girls and women. The Circle of Sisterhood has partnered with buildOn to build schools in Nicaragua and Senegal. They have funded a total of seven schools with buildOn and the rest will break ground in the coming months. We asked Ginny to reflect on Circle of Sisterhood’s partnership with buildOn and why she is committed to expanding opportunities for women at home and abroad. How does it make you feel to be part of buildOn’s International Women’s Day campaign? I am honored to stand in the company of accomplished women who are committed to making the world a better place for girls. And it’s important to the Circle of Sisterhood to support the work of buildOn because the organization’s work is congruent with our mission to remove barriers to education for girls. Our mission is to uplift girls and women from poverty and oppression through education. We want the women who travel to build schools to see first-hand the impact they are having on the lives of people who live in abject poverty and how much it means for girls and women to feel empowered through education. This is why buildOn is our implementing partner – because of your commitment to gender equality in the communities and villages where you build schools. We want our participants to understand different cultures and to grow in their commitment to making a difference in the world. Why are you personally committed to helping break down barriers that girls and women are facing at home and abroad? It’s 2015 and not one single country in the world has achieved gender equality. That has to change. I could quote a book full of stats here about the oppression of women worldwide – devastating, brutal, deadly oppression. Education is the answer to most of the global issues women face. I know how privileged I am as a college-educated woman living and thriving in the United States. I feel a responsibility to remove barriers to education because education should be the right of every girl. When more girls and women are educated the world will be a better place because educated women are more likely to stand up to injustice. Have you had any personal experiences that solidified your commitment to making a difference in the world? I read the book Half the Sky: Turning Oppression into Opportunity for Women Worldwide in 2009. It was a life changing experience. Within ten months, the Circle of Sisterhood was an official U.S. 501c3 charity raising money to remove barriers to education for girls and women around the world. We haven’t looked back. In 2013, when I traveled to Senegal with buildOn to build the first Circle of Sisterhood school, it solidified everything. You don’t understand abject poverty until you see it. That experience makes the work we do much more meaningful. To leave that village knowing that sorority women in America had had such a significant impact on the people of Ndoffane Boure was indescribable. Why is it important for young women to have opportunities to make a difference in the world? I believe the millennial generation is the most global-minded generation in U.S. history and truly want to make a difference by making the world a better place. The young women we have the pleasure to work with – sorority communities on 175+ campuses across the country – understand their privilege as some of the most educated women in the world and feel a responsibility to help other girls and women achieve education. When they learn that not even 7 percent of the world has a college degree and that 70 percent of out-of-school youth in the world are girls, they understand clearly why they should be part of the solution and have a global humanitarian impact. What advice do you have for our world’s future female leaders? Build and leverage relationships and experiences to find your passion. Trust that you will make a difference in the way that you are supposed to. And be a woman who inspires other women to realize their potential. 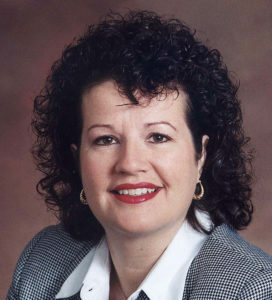 Ginny Carroll had a long career as a leader in management and consulting before founding the Circle of Sisterhood in 2010. She is committed to making the world a better place for girls and women by investing in sorority women at home and supporting educational initiatives abroad.